French educator; born at Avignon Jan. 22, 1827; died at Nanterre (Seine) Oct. 5, 1891. Hément was a schoolmaster all his life, rising to the position of primary inspector of the department of the Seine, and retiring in 1886 with the title Honorary Inspector-General of Public Instruction. During the war of 1870 Hément was entrusted with special work relating to the defense of the fort of Vanves. He afterward gave innumerable lectures throughout France for the purpose of aiding the advancement of popular instruction. Those which he delivered in the department of Aisne in 1883 brought about a conflict with Mgr. Thibaudier, then Bishop of Soissons, which caused some stir at the time. Menus Propos sur les Sciences, 1866. La Force et la Matière, 1867. L'Homme Primitif, 1868. De la Force Vitale, 1870. Famille, Propriété, Patrie, 1872. 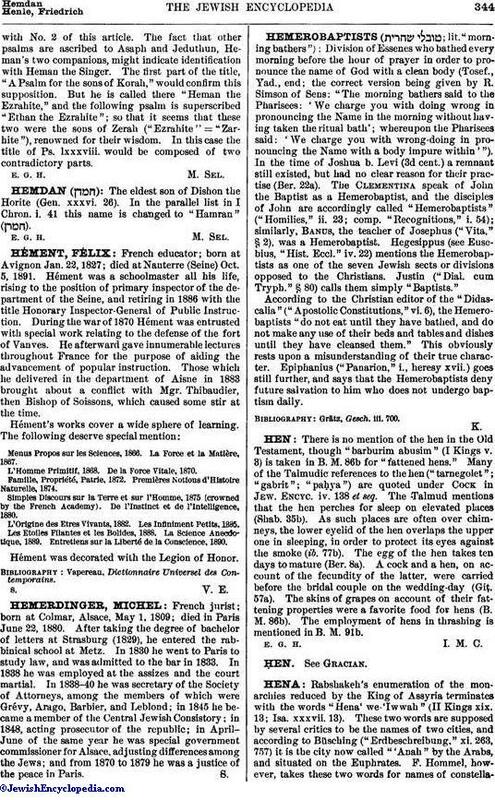 Premières Notions d'Histoire Naturelle, 1874. Simples Discours sur la Terre et sur l'Homme, 1875 (crowned by the French Academy). De l'Instinct et de l'Intelligence, 1880. L'Origine des Etres Vivants, 1882. Les Infiniment Petits, 1885. Les Etoiles Filantes et les Bolides, 1888. La Science Anecdotique, 1889. Entretiens sur la Liberté de la Conscience, 1890. Hément was decorated with the Legion of Honor. Vapereau, Dictionnaire Universel des Contemporains.